USDCHF has halted its 2- week of loosing streak and shown a more than 50 pips recovery. USD was trading weak against all majors yesterday after dovish Fed policy.But better than expected US jobless claims and Philly fed manufacturing data has helped US dollar to pare most of its loss.The pair hits high of 0.99561 and is currently trading around 0.99618. On the higher side, the pair is trading slightly above 0.99487 (23.6% fib) and any violation above targets 0.9972 (89- day EMA)/1.0000/1.0030. Any break above 1.0060 confirms minor bullishness and a jump till 1.010. 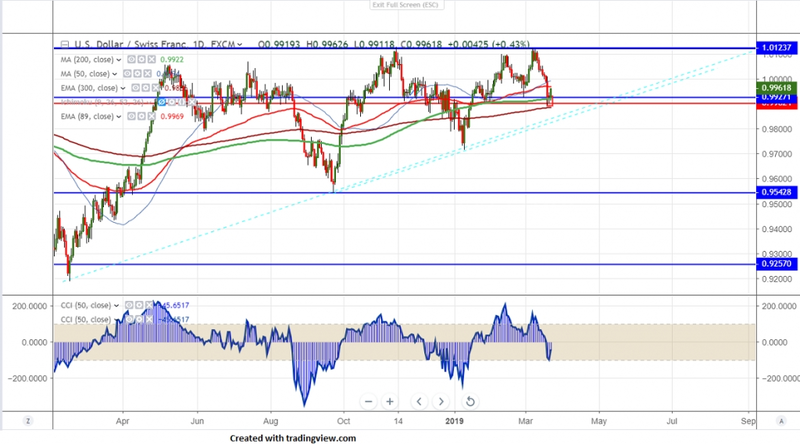 The near term support is around 0.9920 (200- day MA) and any daily close below will take the pair to next level till 0.9850/0.9830. It is good to buy on dips around 0.9940-425 with SL around 0.9900 for the TP of 1.000/1.0030.